Over on his blog, Andy Dickinson, who teaches digital and online journalism at the University of Central Lancashire, reflects on a question he posed via Twitter last night, while monitoring activity on the platform in relation to the violence taking place in London and beyond. He said his question was prompted by Tweets from journalists outside London stating that nothing was happening on their patch. But other Twitter users were quick to cast doubt on his statement. His blog post details the points made, but one of their points was that the value of what a journalist reports is not always about news but the provision of information. That, as a trusted source, journalists could let the online community know whether or not there was substance in rumours circulating on sites such as Twitter, that violence was building elsewhere. Ultimately Dickinson “held up his hands” (via a hashtag), and his subsequent blog post today (9 August), reflecting on the issue, and some elements of the argument he still stands by, gives some food for thought about the use of social media by journalists in these sorts of situations. Despite protestations of its importance ‘no news’ statements like that would never make the front page or head of a bulletin. As Neil Macdonald pointed out that they where [sic] more information than news. Journalism as a source of information – very valid. A few tweets did quote authoritative voices – police etc. That was better. Some proper information in there. Many did not. Online video journalist Adam Westbrook also offers his thoughts in this blog post, on what he calls the “messy” situation for the media using social media/user generated content. He got caught up in the so-called “mess” when retweeting video footage which was originally linked to the wrong location. On the plus side, I do think real-time web’s ability to self correct is extraordinary. My blunderous retweet was corrected within five minutes. If you don’t mind taking stern words from other users, it’s a rock solid facet to the platform. However, Twitter being used by journalists, who (hopefully!) question sources and try to verify, is one thing. But non-journalists aren’t necessarily as skeptical of information. A rumour to a journalist could be read as fact by someone else, especially people who are scared. This entry was posted in Editors' pick, Social media and blogging and tagged Adam Westbrook, Andy Dickinson, digital and online journalism, Journalism, London, London riots, online community, Real-time web, social media, Twitter on August 9, 2011 by Rachel Bartlett. This entry was posted in Editors' pick and tagged data, Real-time web, right-time web on April 16, 2010 by Laura Oliver. Paper.li, a new (but not officially affiliated) Twitter application, has launched in alpha. It creates a ‘newspaper’ using links that have been shared by both the specified user and the people they follow – from the past 24 hours. Paper.li calls the Twitter account the ‘editor-in-chief’ and the people being followed by the account the ‘contributors’. The user’s live stream is shown at the side of the page and the main page displays content around related subjects. Google ads are placed at the right hand side. H ere’s a section of what the @journalismnews’ page, or paper, looks like. I wasn’t sure what to expect given that we’re following quite a diverse mix of people, but it’s actually quite tailored to our patch, journalism and media, with a live #journalism stream as well. But as you scroll down, the links become less relevant, with a ‘Switzerland’ section at the bottom of our page. This entry was posted in Newspapers, Online Journalism, Social media and blogging and tagged paper.li, Real-time web, Technology/Internet, Twitter on April 13, 2010 by Judith Townend. The Today programme has a brief interview with Janic Tremblay, journalist for Radio Canada, one of five journalists from French-speaking radio stations involved in a five-day experiment this week using social media sites and networks as their only source of news. Tremblay explains the set-up of the project (which has been criticised by some media commentators), what they have learned so far and, in particular, the opportunities and challenges provided by using Twitter. Listen to the short clip at this link. This entry was posted in Social media and blogging and tagged Janic Tremblay, Radio Canada, Real-time web, social media on February 5, 2010 by Laura Oliver. One Man and His Blog: Liveblogging or livetweeting? Adam Tinworth looks at the positives and negatives of covering a live event with Twitter – and comes out with some handy suggestions for any journalists looking to use the tool for live coverage. This entry was posted in Editors' pick, Events, Social media and blogging and tagged Adam Tinworth, liveblogging, Real-time web, static web, Twitter on September 17, 2009 by Laura Oliver. Proponent of link journalism Publish2 has introduced a set of new features aimed at ‘curating the real-time web’ for newsgathering and news coverage. Referring to recent coverage of the Iranian election protests and the growing use of tracking news on Twitter by monitoring hashtags, Publish2 now allows uses to aggregate, tag and repurpose Tweets as a widget or feed. “Social Journalism has clear value for breaking news, to curate what’s already being shared on the real-time web,” writes founder Scott Karp. 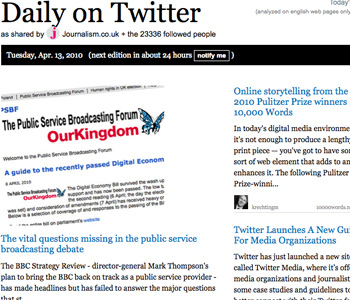 This entry was posted in Editors' pick, Handy tools and technology, Social media and blogging and tagged Publish2, Real-time web, Scott Karp, Twitter on July 28, 2009 by Laura Oliver.